One diet that has a majority of the fans in the Java community as well as in other regions in Indonesia, namely vegetable tamarind. Even vegetable tamarind has many variants in each region with a distinctive taste and differentiate with other regions. One of the variants that will be presented is a recipe to make Java tamarind vegetable very tasty. The food is usually served in the dry season. With the sour taste of the fruit of the tamarind is shown to be one of the ingredients to make it. Bring up a refreshing sour taste sensation. If you are curious how to make vegetable tamarind Java is very tasty, not hurt you to try making your own in your kitchen. Here will display the full recipe on how to make this sour vegetable. To make it, you can listen to the following steps. First boil water in the pot, which then enter the spices and ginger into the boiling water. After that, enter the bean that has been cut into pieces, peanuts have you peel, sweet corn, and skin melinjo. Let stand until half cooked. Then you enter your squash that has been diced and added water was acidic. Once cooked, turn off the flame and sour vegetable Java has prepared you serve. 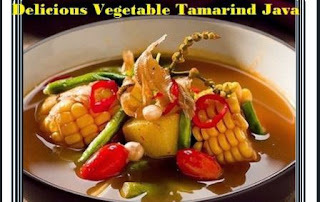 Not easy to make vegetable tamarind Java? May be useful. 0 Response to "Delicious Vegetable Tamarind Java"